Peel and finely chop onion. Peel white asparagus from tip to stem. Trim ends. Cut asparagus tips and set aside. Finely slice stem. Only peel the bottom third of green asparagus. Trim ends and cut tips. Cut remaining asparagus into equal-sized pieces. Cover white and green asparagus tips, as well as green asparagus pieces, and set aside. Melt butter on medium heat in a medium pot. Add diced onion and white asparagus tips. Sauté until translucent. Deglaze with white wine, then bring to a simmer for approx. 1 – 2 min., until alcohol is evaporated. Add cream and milk to pot and keep simmering for approx. 15 min on low heat. Remove from heat and purée with a hand blender. Let simmer for approx. 3 – 4 hrs. Remove salmon skin from fillet. Season salmon with salt and finely chopped dill. Transfer salmon to a sheet of plastic wrap, wrap, and freeze overnight. Soak gelatin in a bowl with cold water. Pour asparagus stock through a sieve into a bowl. Squeeze out gelatin sheets, add to warm asparagus stock, and let dissolve. Season with sugar, salt, and pepper. Using a measuring cup, fill liquid into molds and refrigerate overnight for approx. 6 – 8 hours, or until panna cotta mixture firms up. Dissolve yeast in lukewarm water in a small bowl. Add flour, olive oil, and salt to the bowl of a stand mixer. Add yeast mixture and use stand mixer to stir until a dough starts to form. Transfer dough onto a clean work surface, then knead by hand until a smooth dough is formed. Cover dough and let rise in a warm place for approx. 1 h.
Preheat oven to 180°C/350°F. Knead dough by hand one more time, then roll out thinly. Cut into long rectangles, approx. 6x5-cm / 2.3x2-in. Grease metal pipes and roll dough around them. Attach dough ends by brushing with egg yolk, then pressing dough firmly to seal. Affix metal pipes to Crunch-Roll 1.0 and bake in the oven for approx. 8 min. Finely grate lime for the marinade. Mix lime juice with mineral water, sugar, vinegar, olive oil, and lime zest. If desired, add more sugar and salt. Just before serving, add white asparagus tips to a pot of simmering water, seasoned with salt and sugar. Add cut green asparagus after approx. 10 sec. and blanch for approx. 1 – 2 min., so that asparagus is softened but maintains a firm bite. Remove from water and drizzle some spoons of marinade on top. For serving, thinly slice salmon, place 4 slices on each plate, and top with asparagus panna cotta. Transfer asparagus tips into crunch rolls and place on top. 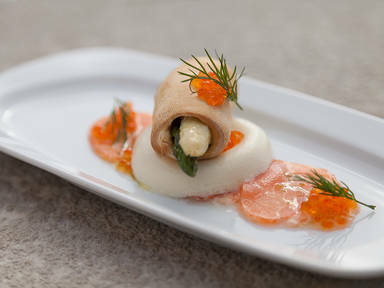 Garnish with salmon caviar and dill. Drizzle marinade over salmon. If desired, serve with chili flakes. Enjoy!